Designed for use with the market's top E-Liquid V2 Platinum this 3 pack of quality EX Blanks could give you up to 45-60 refills before buying another. V2 EX Blanks are now part of the V2 Cigs cartridge line up and can be used with all V2 Cigs Classic, EX Series batteries and Shisha Kits. This Mini Tank style transparent cartridge/clearomiser has a screw cap and gives a lovely rich taste. EX Blanks are designed to be filled with V2 tested e-liquid. It is important that you use the best e-liquid which has pure and tested ingredients, V2 e-liquids are all laboratory tested and you can get your own online ingredient report. Much lighter and less bulky than large and ugly vaporizer & E-cig "tanks". To get the best usage from your EX Blanks we recommend that you keep the tank regularly topped up with e-liquid because this will keep the wick permanently moist to give you the best taste and vapour. Pair your EX Blank with any of our mouth-watering V2 Cigs Platinum E-Liquid & Shisha flavours! Indulge in the rich, tobacco flavours of V2 Red, Sahara and Congress. Cool off with V2 Menthol, Peppermint or Mint Tea. Need to satisfy that sweet tooth? Indulge in Chocolate, Cherry, Vanilla or Coffee. 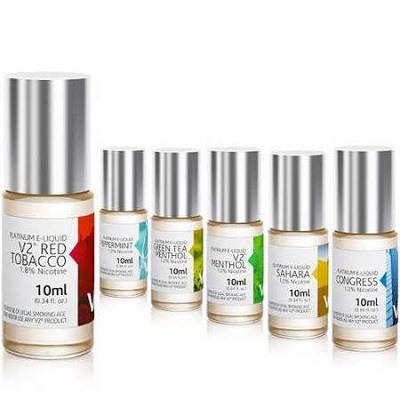 All e-liquids are available in your choice of 1.8%, 1.2%, 0.6% or zero nicotine strength. Try a selection of our best e-liquid flavours with a V2 E Liquid Sample pack, 6 great flavours in one handy selection pack. All V2 e-liquids and cartridges have a batch code identifier that can be used to obtain a full online laboratory report of ingredients. The vast majority of e-liquids providers do not offer this safety net. V2 e-liquid is designed and tested to ensure purity and consistency and optimised to work with our Ex Blanks and V2 battery specification outputs for a clean and optimum vaping experience. V2 E-Liquids - Individually lab tested for purity. Watch this short video to see the best way to fill V2 EX Blanks. Thanks for your excellent customer in response to my last review. You replaced my EX Blanks with the "old" version and they are perfect. Will continue to use these. Highly recommend if want lightweight unobtrusive classy vape out and about, works well with Platinum Eliquid range, learnt best to stand 10 mins before use, usually refill 15+ times. Prefer function with the longer batteries. These are so easy to use. Fill them up attach it to your battery and your ready to go. Provided you don't let them go to dry they can be used quite a number of times. This is just an excellent product, and my favourite way to vape so far. I would like to see a product where I can replace the cotton and wire myself though, my only issue is that I throwing away some well manufactured piece of glass, metal and plastic every week. This feels a little wrong. I did pull apart the tip, and it looks like there is just a wick wrapped in titanium wire, seems like it could be replaced easily? Team Vapour2 response. We love it when our customers make suggestions about the products that we can forward to the developers! Excellent tanks and as per the description, they don't leak. Wife swears by them. Slim design and comfortable/natural to hold when weaning yourself off cigarettes. Will continue to buy. I find this product excellent as using the liquid with this I am a much cheaper alternative to the pre filled cartridges that I used previously. I seem to get through 1 a week so that suits me fine.